A few weeks ago, Tom Heaton was on the phone with a reporter extolling the virtues of a new earthquake early warning system he helped invent. Suddenly, an alert flashed across the computer screen in his Los Angeles-area office. Heaton, the director of the Earthquake Engineering Research Laboratory at the California Institute of Technology, is part of the team of California researchers behind the new warning system, called ShakeAlert. It’s triggered by the earliest waves of a quake, which are too subtle for humans to feel. For now, these researchers are the only ones who receive warnings of a quake on the way. But that may soon change, as California Gov. Jerry Brown signed a bill in September that would begin the process of bringing these alerts to the public across the Golden State. Heaton has even bigger hopes of offering it across the entire West Coast, now that researchers have projected a 40 percent chance that a major earthquake will strike off the cost of southern Oregon in the next 50 years. All that’s holding ShakeAlert back is the price: $120 million over five years for a system that covers the entire West Coast or $80 million for a statewide system. That would buy more monitoring stations (each one costs $20,000-$30,000 for a seismometer, GPS instrument and data logger), a more robust communications network to transmit signals and rigorous stress testing to make sure the system could hold up in even the strongest quakes. After all that, the system would need about $16 million a year to run across the West Coast. So far, lawmakers haven’t budgeted any money for the system. Gov. Brown has asked the Office of Emergency Services to come up with a plan for funding ShakeAlert by 2016 but has already made it clear that the state’s $96 billion general fund is off-limits. The agency plans to set up a committee to explore options, which Padilla said might include public-private partnerships, a telecommunications surcharge, redirected high speed rail funding or federal grants. ShakeAlert is modeled on successful systems in Mexico, China and Italy, as well as one that gave 52 million Japanese citizens precious seconds to prepare for the 2011 magnitude-9.0 Tohoku earthquake. One of the most oft-cited success stories is that of OKI Electric Industry in Japan, which installed its own earthquake early warning system in a microchip manufacturing facility after the factory sustained $15 million in damage in two earthquakes in 2003. Another two similar quakes hit after the $600,000 system was installed — and this time, the damage only cost $200,000 to fix. The plant was up and running in just a few days, instead of the weeks it took to come back online in 2003. The $80 million price for the California system may seem high, but the total budget this year for the Office of Emergency Services is $1.2 billion and California itself has an annual budget of $145 billion. “If you think about the fact that earthquake damage and reparations is counted in the billions of dollars and we’re only asking to build in the low millions of dollars, this is pretty much chump change,” said Jennifer Strauss, a spokeswoman for the Berkeley Seismological Laboratory. Meanwhile, the clock is ticking — California has the highest density of fault lines in urban areas in the U.S., and a 99 percent chance of hosting a magnitude-6.7 or stronger quake in the next 30 years, according to a report recently published in Nature by Richard Allen, director of the Berkeley Seismological Laboratory and one of the pre-eminent seismologists in the country. His lab built ShakeAlert over the past six years in partnership with Caltech, the U.S. Geological Survey, the Swiss Federal Institute of Technology in Zurich and the Southern California Earthquake Center. Even though the funding isn’t in place, the science is solid. The system works because earthquakes come in two waves. P (or primary) waves come first, and they’re too subtle for humans to detect (though cats and dogs can feel them). They ripple out from the epicenter several seconds ahead of S (or secondary) waves, which cause the shaking and damage that we recognize as an earthquake. 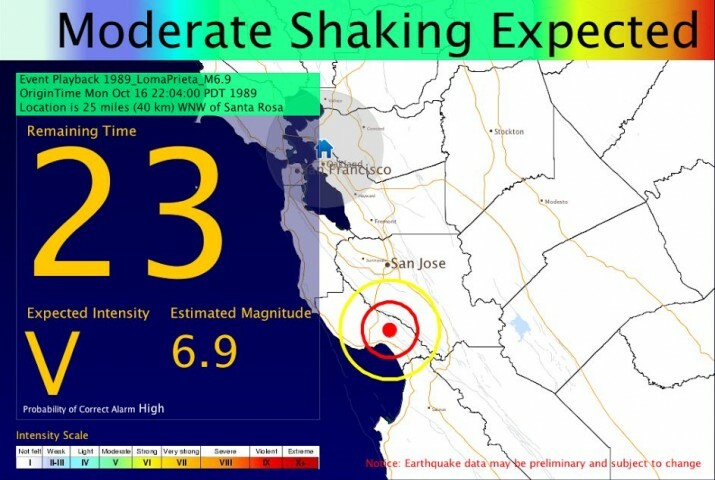 Once the P waves register on a bank of 400 seismometers around the state that are maintained by ShakeAlert’s partner institutions, the raw data is instantly transmitted to a suite of central software that processes it using three algorithm calculations. The first, known as ElarmS, collects data from multiple seismometers and calculates the location and magnitude of the earthquake. The second, called Onsite, does the same based on just one seismometer, ideally located near the epicenter. The final algorithm is called Virtual Seismologist, which adds topography and recent seismic activity to the analysis. Once these algorithms have each applied their logic in a process that takes just seconds, the data is passed on to another piece of software called the decision module which synthesizes it in an instant and issues an alert to users, including the earthquake’s magnitude, location and expected degree of shaking (weak, moderate, strong or very strong). Software installed on the user’s device – whether a laptop, smartphone, radio or TV – translates this information into a countdown for their specific location based on estimates of the speed at which the waves are traveling through the earth’s crust. The longest advance warning a user can expect is two and a half minutes. Many warnings will be significantly shorter. But even a few seconds of warning could be enough time for people to take cover, seek shelter or pull over to the side of the road to ride out a major quake. The signal can also be channeled into automated systems that turn off factory equipment, warn incoming airplanes to steer clear of the runway and signal doctors to halt delicate medical procedures. Developing these applications will largely be a job for the private sector once the signal is publicly available. For now, alerts from the California warning system are only broadcast to 50 scientists and 36 partners of the California Integrated Seismic Network, the group of institutions that operate the demo system. The signal isn’t yet being released to the public because researchers first want to make sure it is as accurate as possible. Six seismologists and a public official in Italy were found guilty of manslaughter and sentenced to six years in prison in 2012 after underestimating earthquake risk before a magnitude-6.3 quake hit the city of L’Aquila in April 2009. Google, Amgen, the City of Los Angeles and Bay Area Rapid Transit (BART) are among those partners already receiving the signal. It takes 24 seconds to stop a BART train, and the transit authority has already installed an automatic braking system triggered by ShakeAlert to stop its trains when a major earthquake is on the way, thereby significantly reducing the risk of derailment and deaths. John Vidale, a seismologist at University of Washington and director of the Pacific Northwest Seismic Network, a group that is working to extend the California system to Washington and Oregon, is more optimistic. He thinks public pressure will mount as more people on the West Coast learn about the system’s potential. And whether it comes before the next big earthquake.